Located in downtown Swansboro, North Carolina. Saltwater Grill is in the heart of the "Friendly City By the Sea" overlooking the Intracoastal waterway and Bogue Sound. 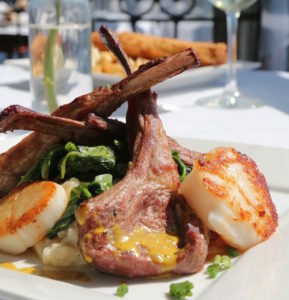 At Saltwater Grill we feature the finest in waterfront dining with a view from every table either inside in a spacious dining area or on our second story deck overlooking the waterfront and docks. We also offer dock dining in season and outside dining along the waterfront for special occasions. Offering fresh local seafood, steaks and cuisine with an international flair prepared by Chef Martin Berndt. Saltwater Grill also offers catering for all types of events and live music outside on our downstairs patio. As we say "Saltwater cures everything!" Chef Martin Berndt is an area native and is coming back to his roots right here in the wonderful town of Swansboro. As the son of a three-­star general Chef Martin has traveled the globe and brings his worldly experience to the table through his kitchen. His culinary experience began in 1991 in Vaihingen, Germany, when his father was stationed overseas. He then returned to the United States in 1995 and continued in Greenville, NC perfecting and growing his knowledge of the culinary arts. Now, with over two decades of experience, Chef Martin is well versed in all facets of the food industry. His vast knowledge of fine cuisine paired with the simplicity of his own palate cultivates an interestingly creative experience! Thankful to be returning to his home to be around friends and family, Chef Martin cannot wait to see friends old and new!